President Obama will announce Friday that he plans to withdraw the bulk of U.S. troops from Iraq by the end of August 2010, but wants to leave tens of thousands behind to advise Iraqi forces and protect U.S. interests, congressional officials said. Mr. Obama, who campaigned on ending the unpopular Iraq war within 16 months of taking office, has been largely focused in his first weeks as president on turning around the collapsing American economy. Friday's expected Iraq announcement comes a day after he unveiled an ambitious budget that promises a major overhaul of America's costly health care system and sets aside an additional $750 billion to help rescue America's troubled financial system. The Iraq withdrawal timetable would stretch over 19 months from his inauguration in January, three more months than he promised during his campaign. He is expected to announce the new strategy during a trip to the Marine Corps base at Camp Lejeune, North Carolina. In a sign of the shifting war debate in Washington, Mr. Obama isn't facing scrutiny over the exact timing of the withdrawal, but rather how deep it really is. The president told a closed-door meeting on Thursday with Republican and Democratic leaders that 35,000 to 50,000 troops would remain in Iraq after the bulk of troops are withdrawn, congressional officials said. The maintenance of a residual force for a period of time is not a surprise, but some leaders of Mr. Obama's own party pushed back on just how big it will be. "When they talk about 50,000, that's a little higher number than I had anticipated," Senate Majority Leader Harry Reid, a Democrat, said before the briefing. 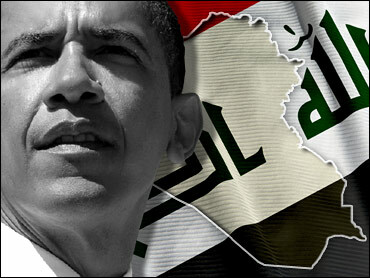 An existing U.S-Iraq agreement, negotiated under President George W. Bush, calls for U.S. combat troops to withdraw from Baghdad and other cities by the end of June, with all American forces out of the country by the end of 2011. However, CBSNews.com's Brian Montopoli reported in the Hotsheet blog that the current administration may be taking advantage of ambiguous definitions of "combat" and "non-combat" troops to keep his withdrawal campaign promise. "There is no such thing as non-combat troops," Thomas Ricks, the Washington Post's Pentagon reporter, said on CBSNews.com's "Washington Unplugged" earlier this month. CBS News national security correspondent David Martin also offered a dose of reality: "The Pentagon will never leave troops in a war zone without giving them the ability to defend themselves," he told Hotsheet. "In other words, those stay behind troops, although they will be designated as 'training and assistance' brigades, will be fully combat-capable." More than 4,250 U.S. military members have died since the war began in March 2003, though U.S. military deaths plunged by two-thirds in 2008 from the previous year, a reflection of improving security after a troop buildup in 2007.